Counterfeit Kit Challenge time! 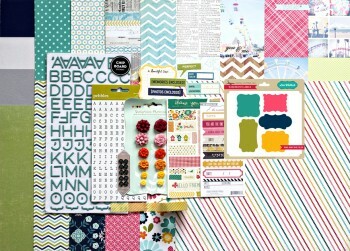 This month the inspiration kit is from Gossamer Blue. This kit came together in record time. About an hour and a half. The monthly review of my main paper drawers is keeping the patterns and colours fresh in my mind, and gets more organized each time I flip through the inventory. 2 each of four colours of cardstock. Various manufactures. And because my cardstock is stored by colour, I am at a loss as to whom to credit, except for the one with the corner outlined with punched holes. It is Bazzill Basics. I used two of this style last month and enjoyed stitching the outline. What treatment I give them this month is going to be a surprise. Both to you and to me. 1. Blue dots, Manufacturer Unknown (muk) This is from my early days of scrapping when I bought stacks of paper from ebay. This month, I finished sorting all that affordable ebay goodness into colours and themes. 5-9. and a page with an illustration, from an ancient Readers Digest Condensed book. These papers represent the top right page in the inspiration which is a sheet of journal cards from Echo Park. In my selection, the red one is Cuisiner Cooking, DDDesigns7 and the remainder are muk. Hardcover, Thickers, American Crafts. This is the one item that I have that is an exact match. Both the turquoise and the beige sets are well used but together should still get some good titles out of them. Substituting for label stickers and digital lables are a handful of assorted labels, randomly pulled from the stash. A couple are Basic Grey, The green scroll die-cut on the lower left is Fresh Beauty by 29th Street Market, the rest are muk. For the "one piece Blue Notions, French General Kit," I am substituting one very cool blue title frame. It's been kicking around for long enough that I don't remember who made this bit of coolness, either. All together they create quite a yummy assortment, presented on this cake stand that was sent to me by Sarah at Squiggling About. Finally, I was in a quandary as to what to call this assortment. Mr. Muddle was polled for ideas. He picked up the antiquated book page and read it's text for inspiration. Together we determined the kit's title to be, "Ocular Distractions." This month is also LOAD (Lay Out A Day) challenge. I did my first LOAD last year at this time and am having a grand time participating again. You can see my uploaded layouts in flickr. Use the button at the top of this page. This being Canadian Thanksgiving weekend, it is a long one for many and a feasting time for most. We will be making traditional dishes tomorrow. Hope you get to enjoy lots of turkey at your house. Thanks for stopping by. Double thanks for comments. I love this kit! I love all the bits and pieces and I can't wait to see what you make with it all!!! I adore all the embellies you've added a beautiful mix! wow!!! what a wonderful kit you've put together... This is motivating! What a rich kit you've pulled together! Love your add-ons. Have a lovely long holiday weekend and I hope you'll scrap a lot :)). What a pretty kit..I love the buttons :) Thanks for dropping by my blog and saying hello. It is nice to meet a blogger from Alberta (I was born and raised there, just near Calgary). Looks terrific - love all the "fun stuff!" That is the best part, isn't it? Have a great month! Oh wow, there are so many goodies there - from the BG paper I recognized at once, to all the "clutter items" as you called them. And it's all made even more adorable on the cute cake stand. I think you've got a great kit there and I adore the pile of scrumptious extras! I keep meaning to put up a photo of that sheet of paper you queried. Maybe if I get home in daylight today I can manage it! I see a very interesting mix of patterned paper there and can't wait to see it all put together in some pretty layouts. As for the "clutter" - I am an embellishment girl at heart so that looks a big pile of scrumptiousness to me! Your kit looks like fun, especially displayed on your lovely plate stand! I hope you have fun with your kit! Lovely kit-especially all of those fab embellies! I enjoyed your writing style! PLUS You've made a great kit! Your photos are wonderful and I love the staging you did with the embellishments on the little tiered stand. I wish you had included one more photo and put the paper and the embellishments all together for our Ocular Distraction! Thank Kristie for your kind comments and suggestion. You are right. I should have included a photo of the entire kit together. I checked to see if I had taken such a shot and sadly, I did not. However, in the future, you will probably be very happy with my kit posts as I have just learned how to make a collage of photos.